This course is designed to introduce you to the many career options within the equestrian industry. You will develop the knowledge and practical skills you’ll need to work within the industry. You will work with horses in a safe environment, complete work experience and enjoy study trips – great preparation for your next steps in study or employment. After doing my A Levels I decided that I wanted a career in horses but didn’t want to leave home, so studying through Reaseheath College at Croft End was an ideal opportunity. I studied here for 2 years where in was taught by Lisa and Claire, and gained my BHS Stage 1+2, Level 3 in Horse Management, Riding And Road Safety as well as both Equine and Human First Aid. After leaving college I went to work on the yard at Gilliver Vets, where I was soon appointed Head Girl. My responsibilities included the day to day running/ overseeing the yard, working alongside the vets and assisting with any inpatients or any procedures that were taking place as well as looking after John and Annes horses, this included getting them fit and prepping them for the hunting season. I would have to get them ready for a days hunting sometimes even a few days away hunting, then when they came back home sorting them out. When hunting season was over the showing season would start, so again the responsibilities of Annes show horses as well as clients horses. So this would include prepping for shows, going through the show dates and planning the season, ensuring all their tack was correct and suitable, feeding, work regime for the week as well as going to the shows with them as a groom. I’ve worked at Gilliver vets for the past 3 ½ years and have loved every minute as well as gaining a vast amount of knowledge and experience that will stay with me for a long time. I now work for John and Anne as their personal groom, with the responsibilities of keeping johns hunters looking smart as well as still having an input on their fitness regimes, tack changes etc. but my main responsibility is being a show groom. This requires me to keep the show horses looking and going well, ensuring all show tack etc is correct and changing it if required. I get the horses ready for the ring and I travel to all the shows with them such as RIHS, HOYS, Royal Windsor, Great Yorkshire, Cheshire County etc. as well as working with these show horses I compete my own when I can, contesting RIHS/HOYS qualifiers at shows such as Cheshire County, Great Yorkshire, N.O.E, etc. Throughout the winter months I clip client’s horses and I have a large client base which includes clipping some client’s horses for major competitions including HOYS which is just around the corner as I specialise in show clips, but I do go out and do general clips. 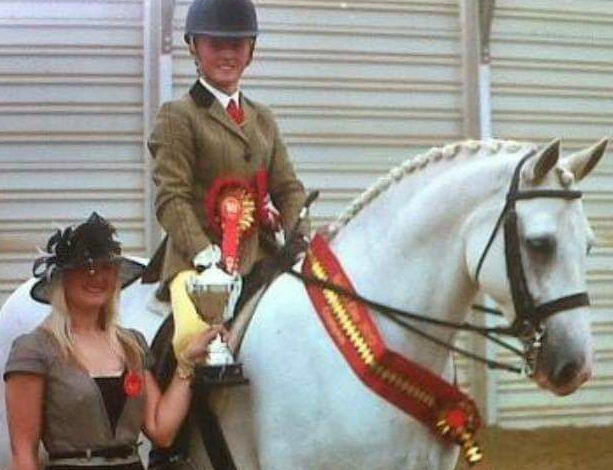 During the summer months and throughout the showing season I have a large client base for trimming and prepping horses for the show ring, including this year winners of RIHS, Great Yorkshire, Cheshire County and Royal Windsor. As well as this I work as yard manager at a riding pony stud where my responsibilities are looking after the mares and foals, yearlings/young stock, weaning mares and foals, and the general day to day running of the yard. I can highly recommend training through Reaseheath College as a pathway to a career in/with horses.